Park Junghwan also plays in the Chinese A league, here we see him in action against Chen Yaoye. – Based on Go Game Guru’s report, which includes the game record and An Younggil 8p’s brief analysis. – Keith Arnold, HKA, EJ Quizmaster. Gu Li 9p chalked up his first win in the MLily Gu vs Lee jubango, forcing Lee Sedol 9p to resign in game 3, on March 30, 2014. Lee Sedol (left) and Gu Li, in Chengdu, China. Lee and Gu faced one another in Chengdu – the capital city of Sichuan, China – having traveled straight there after their game at the 10th Chunlan Cup two days earlier. After Lee won game 2 of this jubango in February, he led the 10 game match 2-0. Since Gu lost game 2 in regrettable circumstances, many Go fans reasonably surmised that Lee would have the psychological advantage going into the third game today. However, over the last week, Lee and Gu have played three games together. Not only is this very unusual, but it may have helped to restore Gu’s confidence. Gu defeated Lee in the 4th Zhaoshang Cup (a China vs Korea team tournament) on March 23, and followed it up with another win at the 10th Chunlan Cup on the 28th. Gu Li 9 dan (left) plays Lee Sedol 9 dan in the third game of their jubango. Because of this, it’s hard to say who had the momentum going into today’s game. Some commentators argued that Lee was saving his energy for the jubango, but perhaps that’s because they were rooting for Lee. We do know one thing for sure though; that today’s game was the only one that really mattered to both players. And Gu Li won. This is, of course, good news for all Go fans – except perhaps the most die hard Lee Sedol fans. A close score increases the likelihood that we’ll be able to enjoy all 10 games. It also makes the series more exciting to follow. Black 17 was an interesting attachment, and the first fight started there. The result up to 31 was a bit better for White (Gu Li), because he became very thick and powerful at the top. White 36 was an unusual move, and a big fight began when Black responded at 37. It was very complicated, and the result up to 61 was playable for both. Black 63 was a severe response to White’s attachment at 62 and the trade up to 71 looked playable for Black, but it was actually an even result. White 78 and 82 were a nice combination, and the invasion at 86 was painful for Black, because White’s influence at the top was too strong. Gu Li’s invasion at White 86 was painful for Lee Sedol. Black 87 and 89 were questionable, and White 90 showed Gu Li’s nice sense of play. Black 91 was an another questionable move, and White executed a nice counter-attack with 92 and 94. White established a solid lead with 102, but Lee started to catch up again with 113 and 115. White 116 and 124 were slack, and Lee caught up through to 144. However, Black 147 was a big mistake, and the game became difficult for Black again. And when White played at 162, the game became desperate for Black. White 178 was a big mistake too, but Gu stayed calm with 182 and maintained his lead. Black 185 was the last losing move for Lee. It should have been played at 186 instead. Black couldn’t find any more chances to catch up after White 188 and Lee Sedol resigned soon afterwards. Gu Li erred with White 178, but kept his cool and won by resignation. It was a very interesting game to watch, but both players seemed to make more mistakes than they usually do. That could be because it was a very complicated game, but they also they seemed to lose focus at some points in the game. Recently, both Lee and Gu have played quite a lot of games and they had very little time to rest before today’s game. I think they both seem exhausted and neither player is in their best form at the moment. Both players will work hard to recover and get back into shape – physically and mentally – in time for game 4. Reviewing the game in detail will take more time, but Younggil will be back soon with his full commentary of game 3. While you’re waiting, you can review all our articles about the match so far on our Gu Li vs Lee Sedol Jubango page. And don’t forget to subscribe to our free Go newsletter to get our weekly updates every Thursday! The Chunlan Cup is an international tournament for 24 players. The 10th Chunlan Cup kicked off on March 26, 2014, in Taezhou, China. The Chunlan Cup is an invitational tournament for 24 top players from around the world. In the first round, 16 unseeded players vied for a spot in the second round. They were joined by the remaining 8 seeded players in round two, on March 28. This year’s North American and European representatives – Jiang Mingjiu 7p and Fan Hui 2p – are certainly no strangers to the Western Go community. Jiang Mingjiu 7 dan represented North America and Fan Hui 2 dan represented France. Jiang teaches Go in the USA, while Fan is the official coach for the French Go Federation. Unfortunately, they were knocked out in the first round by China’s Tuo Jiaxi 9p and Japan’s Cho U 9p respectively. Taiwan’s representative, Wang Yuanjun 7p, was also knocked out in round one, by Japan’s Iyama Yuta 9p. Wang, who’s currently regarded by many as Taiwan’s strongest player, gave Iyama a scare in a close game. However, Iyama was able to win by half a point after Wang made a mistake in the endgame. Japan had two other players advance to the second round after Kono Rin 9p defeated Fan Tingyu 9p and Murakawa Daisuke 7p defeated Lian Xiao 7p. The other winners from round one were Tang Weixing 9p, Mi Yuting 9p and Gu Li 9p. Lots were drawn to determine which seeded player the winners of the first round would face in round two. This year, seeds were awarded to Chen Yaoye 9p, Jiang Weijie 9p, Zhou Ruiyang 9p, Shi Yue 9p, Lee Sedol 9p, Park Junghwan 9p, Kim Jiseok 9p, and Choi Cheolhan 9p. As we mentioned yesterday, the universe seemed to be playing some sort of joke in once again pairing Gu Li against Lee Sedol. However, it’s worth noting that several international tournaments, including the Chunlan Cup, setup the draw to minimize intra-country clashes in the earlier rounds. Gu Li 9 dan draws Lee Sedol 9 dan as his opponent in round two. An Younggil 8p provided some brief commentary on selected games. The first fight began with White 52. Up to White 88, the game was even. White 92 was questionable, and Black 101 and 103 were a nice counter-attack. Black took the lead up to 129, after establishing a large territory. Black 207 and 209 were very nice endgame tesuji to finish the game. The opening was peaceful, and both players seemed to like that. Black 31 and 33 were a nice sequence and, up to 37, the opening was favorable for Black. Black 71 was big, and the game was still good for Kono. White 94 and 96 were a nice combination and the game became very close. In the end, Kono was winning by half a point, and Fan resigned. Black started with nice opening, and the game was favorable for Black up to 67. Black developed a large territory in the center up to move 91, but he should have exchanged F17 for G17. The game became very close up to 110. Black 175 was the losing move, and White reversed the game with 176 and 180. Round two was played on March 28, 2014. The majority of attention was on the game between Gu Li and Lee Sedol. This happened to be their 40th encounter. Gu managed to give himself another mental boost before Sunday’s Jubango, by defeating Lee in a close game. After a great opening round, Japan made a disappointing showing in round two. Zhou Ruiyang had a surprisingly straightforward win over Iyama Yuta. Meanwhile, Murakawa Daisuke and Kono Rin also failed to progress to the quarter finals, falling to China’s Shi Yue and Chen Yaoye. However, Cho U had better luck than his compatriots, defeating China’s Jiang Weijie convincingly. Chen Yaoye 9 dan (left) defeated Kono Rin 9 dan. White had a nice start up to 60 and a big fight started with Black 63. A ko fight began at move 95, and the result up to 148 was still good for White. Black 149 and 155 were a good combination, and the game became very complicated up to 177. White 188 and 194 were good moves and Park managed to save the game. The opening up to 57 was successful for Black. There was a big ko fight and the trade up to 104 was good for Black. White 116 was a very nice tesuji, and White 132 was typical of Lee Sedol, making the game complicated. Lee caught up by attacking Black’s left side group, and the game became very close up to 218. White 250 was the losing move, and Gu won the game with 251 and 257. In the end, Lee was losing half a point, so he resigned. Lee Sedol after the game. Cho U started the game with a joseki he invented, at White 6 and 8. Black 29 and 31 were questionable, and the opening up to 40 was favorable for White. White 66 and 68 were sharp, and the result up to 86 was successful for White. White 94 was a very good move and Cho maintained a solid lead up to 104. White 132 was a brilliant move and the game was practically over at that point. It was a great game by Cho U.
Jiang Weijie 9 dan (left) was defeated by Cho U 9 dan. Cho will be Japan’s only representative in the quarter finals. Black 29 and 31 were a nice combination and Zhou got off to a good start. Black 43 and 45 were practical and severe, and Iyama was in trouble. Up to 67, Black made a big territory, and the game was still good for him. Iyama started to attack with 68, but Zhou’s responses were perfect up to 85. Black 119 and 121 were very sharp, and White’s eye shape was gone. After Black 127, Iyama couldn’t find any chances to catch up, and he resigned soon afterwards. The quarter finals and the semifinals will be played in late 2014 and the final will be played in 2015. As always, we’ll keep you updated on its progress. 10th Chunlan Cup Quarter Finalists (from left): Kim Jiseok, Gu Li, Cho U, Chen Yaoye, Zhou Ruiyang, Shi Yue, Mi Yuting and Park Junghwan. While everyone else heads home for the time being, Gu and Lee head straight to Chengdu for their match on Sunday. They both have one day to rest in between. Chengdu is the capital of Sichuan, a neighbouring province to Gu’s hometown, Chongqing. The Chunlan Cup is an invitational Go tournament for 24 top players from around the world. In addition to players from China, Japan, Korea and Taiwan, a European and a North American representative are also invited. The top 8 seeded players proceed directly to round two, while the remaining 16 play a single elimination round, knocking out 8 players. After the first round, the remaining 16 players compete in a knockout tournament, culminating in a best of three final. The tournament is sponsored by Chunlan Group, a Chinese conglomerate with interests in the air conditioning, domestic appliance, automotive, finance and alternative energy industries. 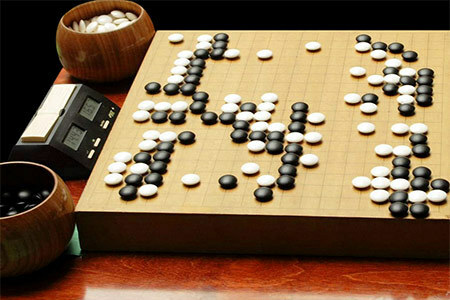 The Chunlan Cup uses Chinese rules, with a komi of 7.5 points, and offers a prize of $150,000 USD to the winner. Click here to download a selection of other game records from rounds one and two. Jingning Xue, with Younggil An and David Ormerod. This attachment is not so easy to find, but might come in handy when destroying your opponents moyo.